How Good Is Our Climate Data? Surfacestations project reaches 70% of the network surveyed. 854 of 1221 stations have been examined in the USHCN network. The Google Earth map below shows current coverage. Only 11% of stations surveyed met the required Class I or Class II requirement of likely measurement error under 1C. Local land surface modification and variations in data quality affect temperature trends in surface-measured data. 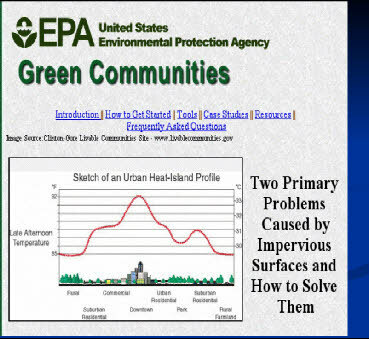 Such effects are considered extraneous for the purpose of measuring climate change, and providers of climate data must develop adjustments to filter them out. If done correctly, temperature trends in climate data should be uncorrelated with socioeconomic variables that determine these extraneous factors. This hypothesis can be tested, which is the main aim of this paper. Using a new database for all available land-based grid cells around the world we test the null hypothesis that the spatial pattern of temperature trends in a widely used gridded climate data set is independent of socioeconomic determinants of surface processes and data inhomogeneities. 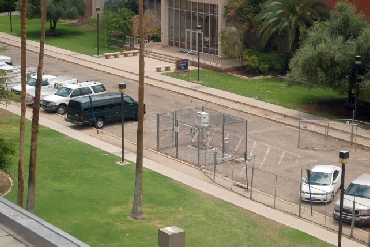 The hypothesis is strongly rejected (P = 7.1  1014), indicating that extraneous (nonclimatic) signals contaminate gridded climate data. The patterns of contamination are detectable in both rich and poor countries and are relatively stronger in countries where real income is growing. We apply a battery of model specification tests to rule out spurious correlations and endogeneity bias. We conclude that the data contamination likely leads to an overstatement of actual trends over land. 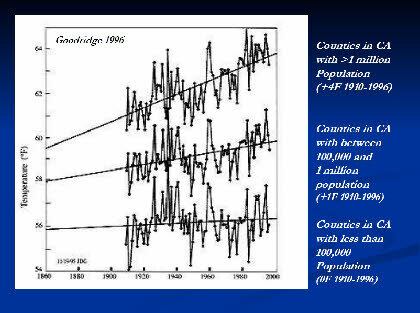 Using the regression model to filter the extraneous, nonclimatic effects reduces the estimated 1980–2002 global average temperature trend over land by about half. Most regions showed a stronger increase in minimum temperatures than with mean and maximum temperatures. Areas of intensive urbanization showed the largest positive trends, while rural, non- agricultural regions showed the least warming. Strong correlations between temperatures and Pacific sea surface temperatures (SSTs) particularly Pacific Decadal Oscillation (PDO) values, also account for temperature variability throughout the state. Southern California had the highest rates of warming, while the NE Interior Basins division experienced cooling. Large urban sites showed rates over twice those for the state, for the mean maximum temperatures, and over 5 times the state's mean rate for the minimum temperatures. See: Recent California climate variability: spatial and temporal patterns in temperature trends, LaDochy, Steve | Medina, Richard | Patzert, William. Climate Research [Clim. Res.]. Vol. 33, no. 2, pp. 159-169. 2007. “Urban-related warming over China is shown to be about 0.1°C decade−1 over the period 1951–2004, with true climatic warming accounting for 0.81°C over this period. “ Jones, P. D., D. H. Lister, and Q. Li (2008), Urbanization effects in large-scale temperature records, with an emphasis on China, J. Geophys. Res., 113, D16122, doi:10.1029/2008JD009916. of its implications are explicated. measurements has not been established as reliably as the IPCC (2007) assumes. Regarding station movements over time, the papers of Jones et al. and Wang et al. Chuine et al. had the data; so they must have known that their conclusions were unfounded. In other words, there is prima facie evidence of scientific fraud. To study the paper properly, I needed to have the authors' data. So I e-mailed Dr. Chuine, asking for this. The authors, though, were very reluctant to let me have the data. It took me eight months, tens of e-mails exchanged with the authors, and two formal complaints to Nature, to get the data. (Some data was purchased from Météo France.) It is obviously inappropriate that such a large effort was necessary. Looking at the data made it manifest that there are serious problems with the work of Chuine et al. In particular, the authors' estimate for the summer temperature of 2003 was higher than the actual temperature by 2.4 °C (about 4.3 °F). This is the primary reason that 2003 seemed, according to the authors, to be so tremendously warm. There is also another reason. The three warmest years on record, prior to 2003, were 1945, 1947, and 1952. (The instrumental record goes back to 1922, or even 1883 if we accept some inaccuracies.) The estimate of Chuine et al. for the summer temperature in each of those years was much lower than the actual temperature. : either the peer reviewers did not have an appropriate background in mathematical data analysis—upon which the paper heavily relied—or they did not honestly check the paper. What is important here is not the truth or falsity of the assertion of Chuine et al. about Burgundy temperatures. Rather, what is important is that a paper on what is arguably the world's most important scientific topic (global warming) was published in the world's most prestigious scientific journal with essentially no checking of the work prior to publication. Moreover—and crucially—this lack of checking is not the result of some fluke failures in the publication process. Rather, it is common for researchers to submit papers without supporting data, and it is frequent that peer reviewers do not have the requisite mathematical or statistical skills needed to check the work (medical sciences largely excepted). In other words, the publication of the work of Chuine et al. was due to systemic problems in the scientific publication process. The systemic nature of the problems indicates that there might be many other scientific papers that, like the paper of Chuine et al., were inappropriately published. Indeed, that is true and I could list numerous examples. The only thing really unusual about the paper of Chuine et al. is that the main problem with it is understandable for people without specialist scientific training. One of the largest known cases of academic fraud and misconduct made the news this week when Anesthesiology News reported that a leading medical researcher was found to have fabricated much, if not all, of the data in his research. Scott S. Reuben, M.D., of Baystate Medical Center in Springfield, Massachusetts, is said to have made up and falsified data in at least 21, and perhaps many more, studies published at least since 1996, according to the results of a year-long investigation by Baystate Medical Center. Jane Albert, a spokeswoman for Baystate, said that the fraud was spotted after questions were raised about two studies for which Dr. Reuben had not even received approval to conduct human research. * The use of one average temperature trend, which neglects that long wave cooling is proportional to the 4th power of temperature. This is a warm bias if the predominance of temperature increases are at cold absolute temperatures and a cool bias if at warm absolute temperatures [Section 2].